Wyoming's only public four-year university is the University of Wyoming, but this institution offers nearly 60 fully online and hybrid undergraduate, graduate, doctoral, and certificate programs. Several of the state's community colleges offer online courses and programs. Casper College offers 11 fully online programs, which range from fire science to general studies, and Western Wyoming Community College offers 12 online associate degrees and certificate programs. Wyoming is also home to WYClass, a database offered through the Wyoming Distance Education Consortium to help students find and register for online classes at in-state schools. According to the National Center for Education Statistics, around 11% of students in Wyoming take online classes. With the lowest tuition rates in the country and high graduation rates, Wyoming's higher education system ranks as fifth best in the country according to U.S. News & World Report. Wyoming students graduate with exceptionally low amounts of debt, and Wyoming residents enjoy a high quality of living. There are many advantages that the online colleges in Wyoming provide. Whether at the University of Wyoming or at a community college, distance learning students in this state can enjoy increased flexibility and affordability. Many online programs at the University of Wyoming can be completed fully online, which allows students to live off campus and save money on transportation. Many degrees at the University of Wyoming are offered asynchronously, which allows students to complete coursework on their own schedules. We selected the online colleges and universities here based on the quality of their programs, types of courses and degrees offered, faculty strengths, as well as school awards, rankings, and reputation, including a strong reputation for online degree programs. Note: In ranking the best online colleges in Wyoming, giving attention to the variety of degree programs available at the institutions is of utmost importance. For this reason, a more prestigious school in Wyoming may offer one, or a few online degrees, but that may not be enough for that school to rank highly among the best online colleges in the state. In this ranking, we are dedicated to showing who's leading the way in delivering quality online degree programs in Wyoming. See who ranks as the best college and university in Wyoming today. 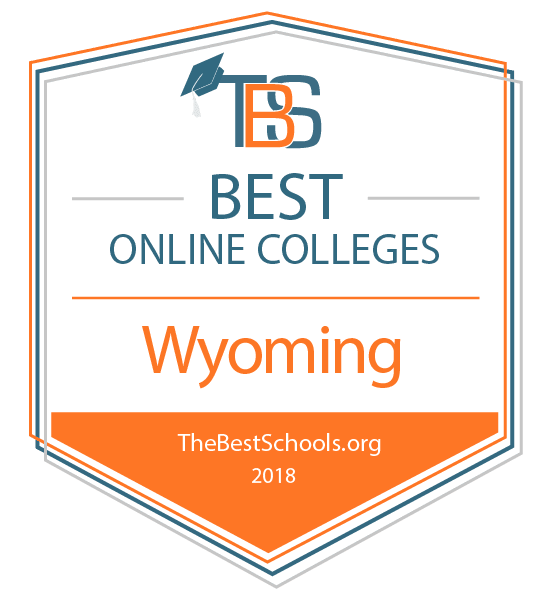 University of Wyoming ranks #1 on The Best Online Colleges in Wyoming for 2018! The University of Wyoming, established in 1886, is a land-grant university nestled between the Laramie Plains and the Snowy Range Mountains. The university offers more than 190 programs, more than 40 of which are available online as well. The campus is home to a number of museums, including an insect museum, an art museum and an anthropological museum. The University of Wyoming offers baccalaureate, master, doctoral and certificate programs online through its Outreach School. Online bachelor's degrees include business administration and criminal justice. Online master's degrees include kinesiology and public administration. Online doctoral degrees include educational administration and nursing. Available online certifications include land surveying and school social work. Online student resources include an online library with librarians available via live chat, text message, email or over the phone. The University of Wyoming is regionally accredited by The Higher Learning Commission (HLC).